Windows Terminal Ware. HTTPS configuration, certificates. Starting from 5.4.26 version stored on terminal local disk terminals' configurations can be edited only by https and it's password protected. For now it concerns only terminal configuration and config.txt for Raspberry, but it's not the end. There's one problem: https is made for real servers. Anв these servers have previously known names. 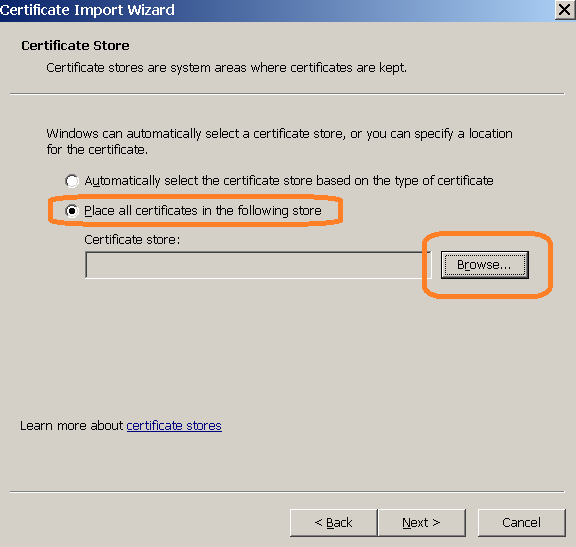 Needed for https encryption certificated are bound to server name or IP address. But we don't know neither names nor addresses of your WTware terminals. It's impossible to release https certificate to arbitrary IP. Browsers do not understand it. It's impossible to release https certificate to any name. The best that browsers agrre is arbitrary part of domain name at the third level. Agree to add security exception for every terminal, where you edit something. Encryption in https works anyway, even when browser send exception, https with such errors is more secure that http with no encryption. You may work this way and do not continue reading. 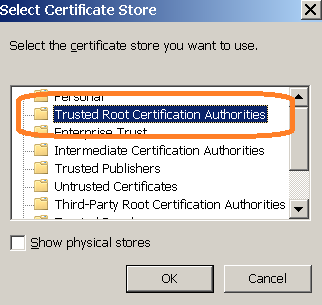 Install our root certificate and configure DNS. It's more complicated, but browser will show green lock image, as for all https sites. Create your own root certificate, install it on your computer and ditribute to all terminals. And configure DNS. 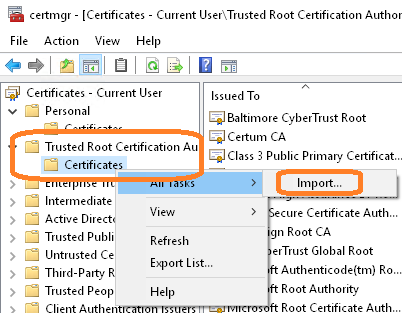 Even more complicated, but you won't have to trust our root certificate. More interesting way is to configure DNS. WTware is able to send DNS updates during configuration by DHCP. Manual for configurating DNS updates from DHCP in Windows is available in Google. 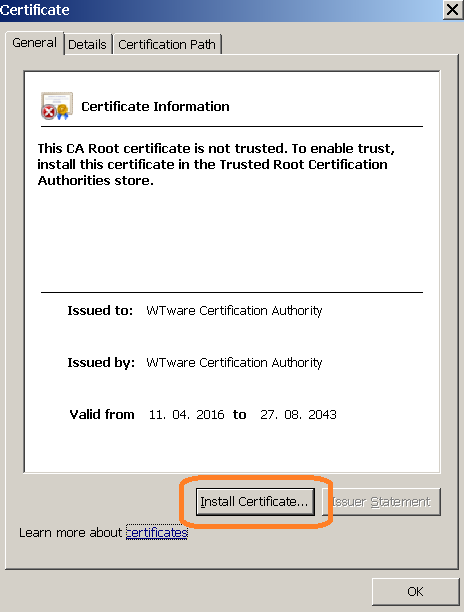 If you don't want to install our root certificate. Or if you want to use other names, not from *.wtware.local. 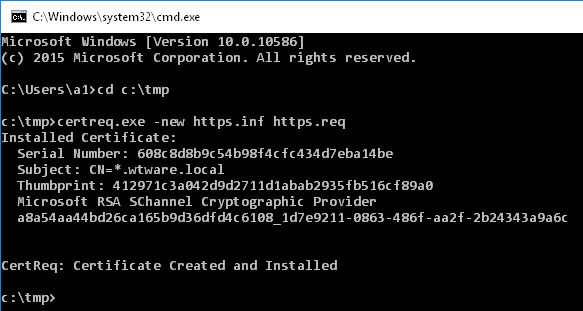 Download archive and extract from it https.inf file. Files https.inf and newly created https.req are not needed anymore, delete them. Select "Yes, export the private key"
Select "Export all extended properties"
Specify password: wtware (six small latin letters). Copy https.pfx to the root of WTware boot USB flash or SD card. 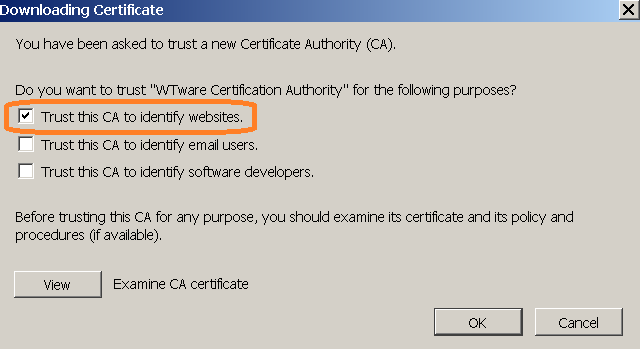 This certificate is also released for *.wtware.local names. DNS is to be configured anyway. But you can bound certificate to other names by editing https.inf.